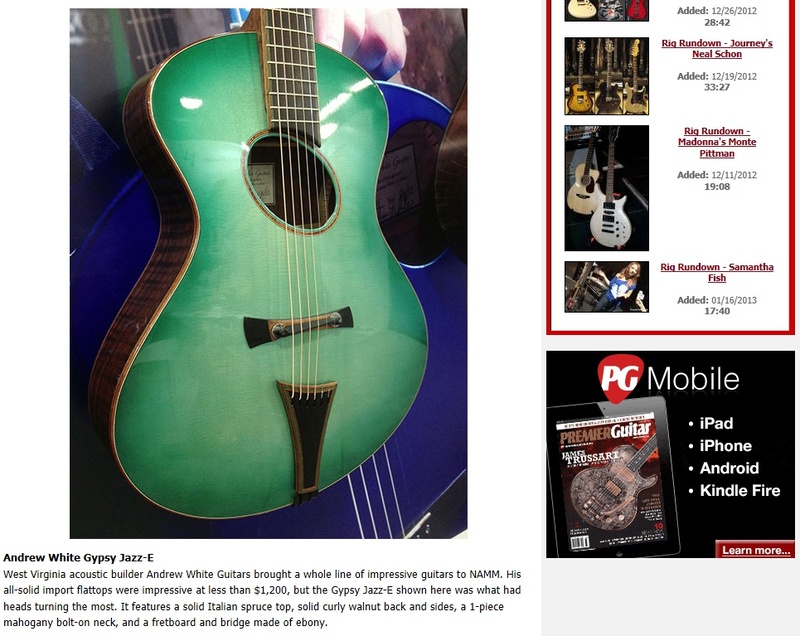 Premier Guitar Editors' Picks is that during NAMM Show 2013' they check out most hot products or unique stuff. Premier Guitar has treat all type of music products, stars, company and so on. Also it introduce new hot products, and news. Let's check what they mention about our products.
" West Virginia acoustic builder Andrew White Guitars brought a whole line of impressive guitars to NAMM. His all-solid import flattops were impressive at less than $1,200, but the Gypsy Jazz-E shown here was what had heads turning the most. It features a solid Italian spruce top, solid curly walnut back and sides, a 1-piece mahogany bolt-on neck, and a fret board and bridge made of ebony."